The Bio-IT community organises a series of beer sessions with a technical focus. These events happen monthly, with each session based around informal discussion of a particular theme. 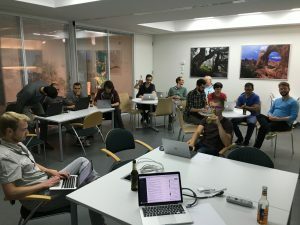 They are a good opportunity to get to know better other members of EMBL HD’s computational biology community, and to learn about the topic. We are always looking for new ideas and themes for these sessions and welcome contributions. If you would like to suggest a topic to be covered in one of these sessions, please contact Toby Hodges. In the first session of this new series, we created a repository of restaurant and bar recommendations in Heidelberg, through EMBL’s GitLab system. Contributions to the repo are warmly welcomed. Upcoming beer sessions will be listed below.